It is crucial to master the basic hits of volleyball to become an proficient player. 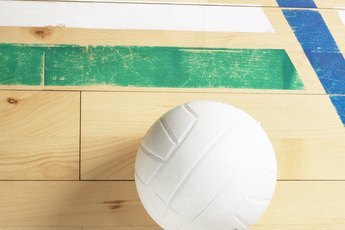 Since the objective of volleyball is to keep the ball from touching the ground on your team’s side of the net, it is important for players to understand basic hits used to move the ball around the court and eventually score. Players must master these hitting skills to advance on their high school and college teams and play effectively in competition. These hits include serves, passes and attacks. 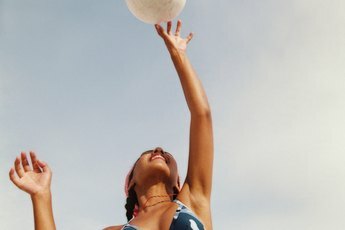 According to the International Federation of Volleyball website, a player must serve the ball over the net to the opposing team to start a rally. The serve is executed from behind the end line of the court. Players may serve overhand or underhand, but the ball must clear the net, otherwise the opposing team will be awarded a point. The Volleyball Worldwide website describes both serving methods. To serve underhand, the player should start by leaning forward with the ball in the hand opposite of her hitting hand and with the corresponding foot forward. She must swing the hitting hand from behind, striking the ball up with her fist or the heel of her hand, dropping the ball just prior to contact. An overhand serve, which is used in high-level competition, is executed by tossing the ball up and striking it with the heel of the hitting hand. In both types of service, the arm should follow through in the direction of the ball. The International Federation of Volleyball states the forearm or bump pass is typically used to receive the ball as it crosses the net following a serve. 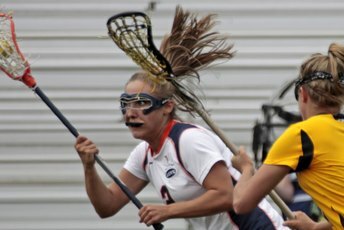 The player must run to the where the ball is headed, bend her knees and bump the ball up high into the air using her forearms. During a bump, the player should place one hand inside the other hand to connect them. She should keep the arms straight and point her hands in the direction of her target to prevent the ball from flying errantly. As the forearms come in contact with the ball, the player extends the legs to elevate the ball in preparation for a set. According to Volleyball Worldwide, the set typically is the second hit following the initial forearm pass. It elevates the ball so it can be spiked over the net to try to score a point. To prepare for a set, the player should face her target, bend her knees slightly, raise her arms so her hands are close to the forehead and open the fingers in the shape of the ball. As the ball approaches, the player should use the surface of her fingers on both hands to lightly but forcefully hit the ball high in the air, then extend her arms and legs in the follow through. During a set, the ball cannot touch the palms of the hands as this called carrying, a violation of the rules. In volleyball, each team is allowed three hits before they must return the ball to the other side of the net. The spike (also known as the hit or the attack) is typically the final hit of the three. After the ball is set high and close to the net, the attacker approaches the ball with quick steps. Then she jumps and strikes the ball in an overhand, downward motion, driving it over the net in an attempt to score by preventing a return by the opponent. Her hand should remain open during the hit. If she snaps her wrist on the hit, she can put top-spin on the ball, making it harder for the other team to block her hit.